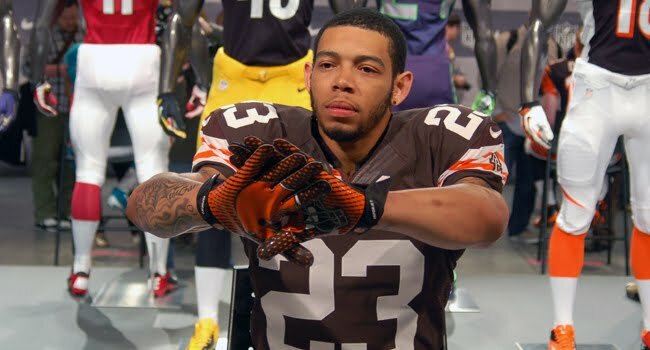 The NFL and Nike unveiled the new uniforms for the 32 teams on Tuesday and the Browns uniforms are essentially unchanged. It definitely could have been much worse. The one disappointment is the gloves the Browns will use. We like how Nike makes the gloves show an image when you put both sides together, but would it have killed the NFL to use the Brownie Elf? Who would argue with that? The most important thing to remember, of course, is that the uniforms themselves don’t matter, what’s important is the players inside the uniforms. LSU cornerback Morris Claiborne reportedly scored a four (out of 50) on his Wonderlic test at the NFL Combine. According to ESPN, his score is the lowest known result by a draft prospect since Iowa State running back Darren Davis reportedly received a 4 in 2000. Our reaction is: who cares? We’re still cool with the thought of the Browns drafting Claiborne and teaming him with Joe Haden in the secondary. As long as he knows to hit the guys in black and gold extra hard, the rest is irrelevant. More importantly, there is little evidence that the Wonderlic has any value in predicting how a player will perform in the NFL. According to ESPN.com, a 2009 study by professors from Fresno State University, the University of Georgia and Towson State found no connection between Wonderlic scores and performance during the first three years of a player’s NFL career. The group studied 762 players from the 2002, 2003 and 2004 draft classes. Finally, it turns out its not only the win totals that are dropping for the Washington Redskins – attendance is also on the decline. The team announced they are cutting 4,000 seats from FedEx Field, bringing the seating capacity to 79,000. As recently at 2010 the stadium sat 91,000. But it’s OK but the Redskins reportedly are a team that wants to “win now” – just without the win part and with fewer fans in attendance.